Turbo starts his IBM Pulse 2013 experience with a quick trip down golf, and “Rat Pack”, history by playing a round at the renowned Las Vegas National golf course, one of the courses where Tiger Woods won his first PGA tournament victory in 1996. For the record, Turbo held his own, shooting an 84 (but convinced he could have gone lower if the greens had held). You know, I joke about Vegas as my second home, but I really do have to admit, it’s a city that continues to grow on me. And I’m sure that couldn’t have *anything* to do with the delightful, if dreadfully slow, round of golf I played yesterday at Las Vegas National. 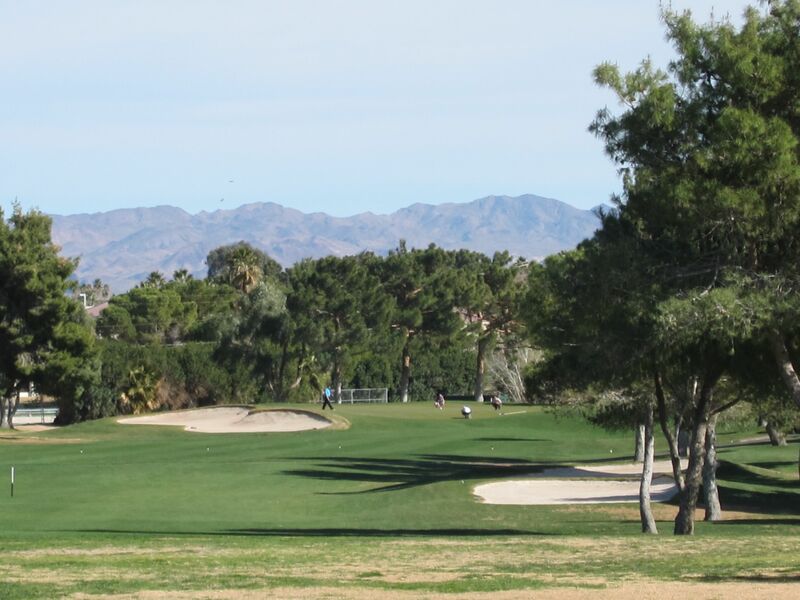 As I mentioned in a post on Friday, this is the very same course (one of three) where Tiger Woods won his first PGA Tour event, the Las Vegas Invitational, back in 1996 (he beat Davis Love III on the first playoff hole to win). It’s also where Dean Martin, Sammy Davis, Jr., and others of the infamous “Rat Pack” used to hang out. I was only fifty years late on that front, but nonetheless, I did experience the course in all it’s glory and managed to pull of an 84. Considering Tiger’s 70 in 1996, I figure I was only .77 strokes a hole behind Tiger. But enough sports analytics, because now all the play is behind me as I get down to work and the matter at hand, IBM Pulse 2013. Please see my last post for some tips and tricks for navigating this year’s event (oh, did I mention, bring or go buy some comfortable shoes)? Amen, oh great IBM Tivoli Confucian hallway philosopher! Of course, this ain’t no Blazing Saddles shindig, so you actually *do* need a stinkin’ badge. So, I picked mine up and wandered on into the Pulse Business Partner Summit to break a little fast, and chat with some of our partners. When the lights went down, IBM Tivoli general manager soon hit the stage to “introduce” himself to the gathered wall-to-wall audience. And it was quite an introduction. I’ve interviewed Deepak a few times now at IBM events, and even I had no idea of his depth of experience at IBM. He explained he’s once been a UNIX programmer and helped bring TCP/IP to the mainframe, had worked on the SP2 supercomputer that once upon a time outwitted a Soviet chess superpower, and helped implement a number of key high availability and systems management capabilities into IBM’s mainframe line. More recently, Deepak was the chief marketing officer for Lenovo before returning to the IBM fold to lead our Business Analytics efforts and oversee the acquisition of SPSS. Deepak warmed the audience to him with a very funny story about having been representing IBM with its new supercomputer at a conference in frigid Rochester. Apparently, the IBM computer was very plain and vanilla looking, and so the competition started making fun of it. Deepak and his team decided to run out to Wal-Mart and purchase some Christmas lights, which they promptly wrapped around their supercomputer (turned out IBM had the fastest supercomputer, Christmas lights and all). IBM Tivoli general manager Deepak Advani opens the Tivoli Business Partner Summit by introducing himself to the Tivoli crowd and explaining the depth and breadth of his background, which began as a UNIX systems programmer and shell script author back in the day. Advani now leads the IBM Tivoli organization worldwide, and will be featured prominently throughout IBM Pulse 2013. After establishing his background and bona fides, Deepak got down to business, reaffirming the critical importance of IBM’s partners to the Tivoli and broader IBM business, but explaining none of us in the ecosystem could rest on our laurels. This, of course, observing a theme pervasive within IBM since CEO Ginni Rometty took the helm: We must focus more on our line of business executives. From CMO to CFO, they are increasingly involved in the IT decision-making process, and the back office has moved to the front, requiring a more collaborative “sell” for both constituencies. Deepak also acknowledged the pain IT organizations felt these last several years, and explained that’s why IBM has worked to try and free them from operational matters with technologies like PureSystems, so that they can spend more time working with their LOB partners on innovation. Finally, Deepak walked the audience through a number of key core and growth priorities, ranking among them the continued focus on mainframe and storage evolution, the importance of standars, and looking forward to growth areas like endpoint management and cloud computing. He also tiptoed through the world of “dev-ops,” with specific regard to managing the life cycles of applications. Finally, Deepak explained we can do more to improve the design and usability of our portfolio, and also use analytics (his old job!) to improve and make better operational decisions. Pulse 2013 is underway…hold on to your console!